There is a gap between what we want our organizations to become and what we put into them to get there. Our imagination is shaped by the tools we use to see the world — the data we collect, the experiences we engage in and the stories we share. Tools are imagined and designed to solve current problems in the context which exists when they were thought of and invented. As these situations expand (the future is not in front of us but outside) tools need to be reimagined or new ones created. If not we become unable to capture the data we need to see the world for what it has become — and we continue seeing it for what it was (looking at the future through the rearview mirror). If our tools are all designed to solve yesterdays problems, then access to and understanding of what is happening today is out of reach. 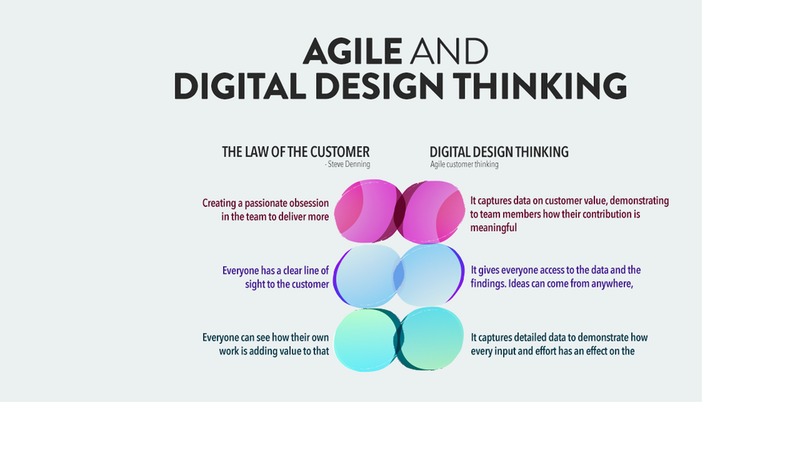 This is why we need Digital Design Thinking — a digital customer insight tool to fuel the organization with understanding of what happens as the customer demands change, the market dynamics become more asymmetric and technologies transform. In the model above we are using purple and green to illustrate how the context surrounding the organization has grown, not changed, but expanded. The future is not in front of us, it’s outside. Old tools are designed to solve old problems (purple problems). This stops modern organizations from accessing the new (green) problems and getting the whole picture. Digital Design Thinking is not a linear sequential process but an interconnected messy process. With the goal of surprising the team and outputting unexpected results. 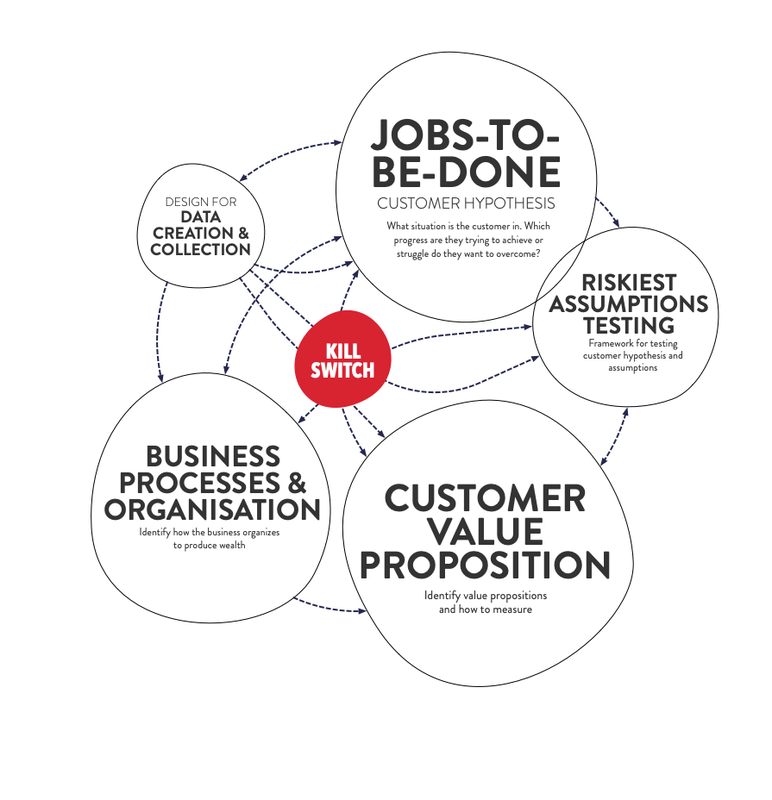 JOBS-TO-BE-DONE - Digital Design Thinking employs a customer framework to the project. Working with a tailored version of the Jobs-to-be-done framework. Understanding the customers context and the progress they are trying to achieve or the struggle they are trying to overcome. Adopting the customers world view is central to Digital Design Thinking. RISKIEST ASSUMPTIONS TESTING - Digital Design Thinking steals its experimental approach from lean processes finding the smallest and simplest way to engage with the customer in order to learn and improve any solution or find any answer. Digital Design Thinking breaks down what we want to achieve. It uses the hypothesis we have towards our customers and the assumptions supporting these hypothesis. Then we find a way to test these assumptions, develop them and continually improve and test them. CUSTOMER VALUE PROPOSITION - How do we measure the value of what we are doing? How do we know when we are producing value for the customer, and when this customer value delivers value back to the organization? Digital Design Thinking develops a set of customer value propositions that we test and measure against, and continuously adopt. BUSINESS PROCESSES & ORGANIZATION - How do we measure the commercial value of what we are doing? We have to do more than evaluate the value of our results based on the customers success. We also include a set of business variables in order to find if we are solving the organizations challenges and meeting the investment goals. DESIGN FOR DATA CREATION & COLLECTION - Customer interactions need to be designed not only for customer value and action, but data collection and insight. We design any customer interaction conscious of how it could help us generate more insight and more data. TRAINING - Digital Design Thinking requires training. A mindset shift towards becoming experimenters, in addition to publishers or product owners etc. And a move from consensus to consent. Or follow Customer Strategy on LinkedIn. Digital Design Thinking is not merely a process, it’s a platform. It requires a digital interface and a digital data backbone. Without the platform there is no digital in digital design thinking. CONTENT LAYER - The content layer is the information, the application, the service or the functionality that we are using to test our assumptions. Unless we tailor our content to produce interactions with the purpose of understanding our customers we are not going to learn much. PLATFORM LAYER - Digital design thinking requires a platform, a meeting place or an arena. An app, a website or a form. Some digital platform where we can publish our content and set up our interaction experiences with the customers. DATA LAYER - We need a sophisticated data backbone able to capture the data and interactions we need to understand in order to test our assumptions and the customer. The data layer collects and presents the data back to the organization. ANALYSIS - It is imperative to the process that anyone in the organization is given easy access to the data. An analyst always asserts his/hers world view to the understanding of the data — so everyone needs to be an analyst (this demands a lot from the accessibility and presentation of the data). Traditional Design Thinking is a fairly expensive experiment involving several roles, teams and processes. Digital Design Thinking ideally tries to redesign or improve current platforms or business practices. A traditional Design Thinking project will solve a problem that exists within a limited time frame — when the project is running. In Digital Design Thinking the process is continuous. We are always running experiments, always collecting behavioral data. Sharing its data openly with anyone on the team / in the organization all the time. Everyone is enabled to be the analyst. Anyone can translate the messy ambiguity into a solution. It is a democratic, inclusive model. 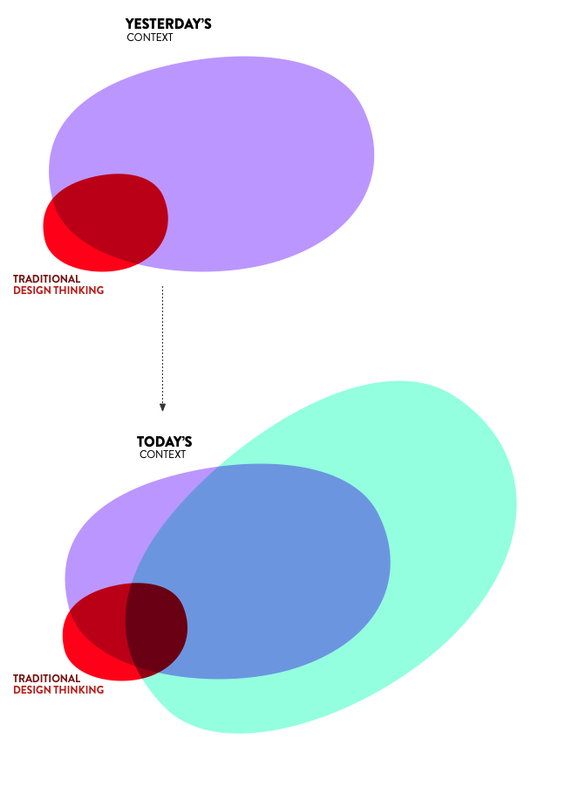 Digital design thinking is built to fuel the agile organization. It has been tailored to fit the need for continuous input that small teams are dependent upon to learn, evaluate and improve. There are a number of advantages to Digital Design Thinking over traditional Design Thinking in the right types of projects. A traditional Design Thinking method collects information and data at the beginning of the process, to inform the process, and then the team gets to work — not touching data again. In a Digital Design Thinking approach we are using data all the time. So its not a linear process with data at the beginning, its more a circular process with data at the center, like a hub, feeding every process all the time. The nature of physical interviewing and prototyping takes weeks or months to plan, execute and analyze. An organization in a digital environment does not necessarily have this luxury. With Digital Design Thinking we are testing and measuring with real time behavior online. Making an instant feedback loop giving the organization needed insight before it becomes outdated. A traditional Design Thinking process is limited to the in-depth analysis of the behaviors and thinking of a small group of people. On digital platforms we can test and collect behavioral data at scale — at close to no additional cost. A short session helping participants familiarize with the core principles of both Riskiest Assumptions Testing and Customer Jobs-to-be-Done. 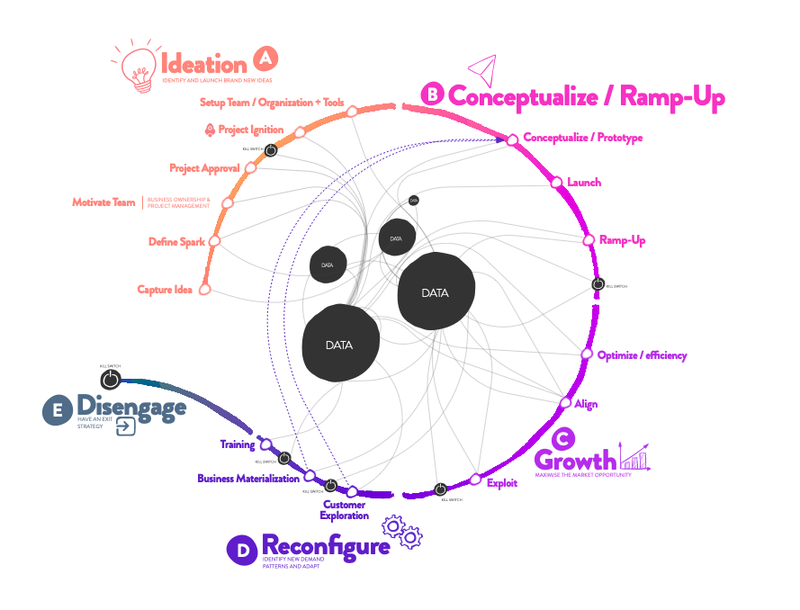 In the center of the Digital Design Thinking / Customer Life Cycle Model there is data. Data feeding every part of the process continous and in real-time. Digital Design Thinking is to be employed at every stage of the product life cycle. Digital design thinking is not only for inventing new products and develop new ideas. 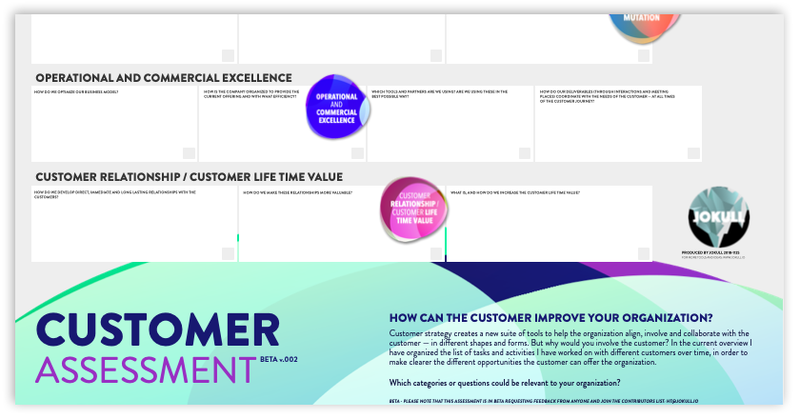 It is a tool to be used by the whole organizations continuously at any stage of the product life cycle in order to identify and understand how the organization can increase and improve its ability to create customer and commercial value. IDEATION - A great idea can come from anywhere in the organization. With the Digital Design Thinking platform any employee can have access to raw data and insight in order to identify and probe their own idea. The organization needs a system that lets these employees market and test their ideas internally in order to motivate coworkers and eventually pitch the idea to management for approval and establishment of the idea as a real project. CONCEPTUALIZE / RAMP UP - This is the invention and innovation of new ideas. It is the traditional process where design thinking has been employed previously, at the start of a products life. The purpose is to find how to design, market, distribute and continuously improve the product in the beginning of its life until it plateaus with a stabile market and healthy margins. GROWTH - Products and services need to be tended to continuously. This can be due to the potential for increased efficiency and optimization, due to new technologies or new routines. A challenge from a competitor and changes in the customer demand. To exploiting emerging opportunities through slightly improving an existing product. Making sure that the product or service is a top performer when it comes to understanding and making the most value from the market. RECONFIGURE - The product or service is at the end of its life cycle and needs to re-invent itself or find a way to exit the market at the lowest cost to the company and its employees. DISENGAGE - The product needs to be pulled from the market. 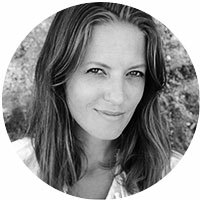 How can we do this with the least possible pain to all involved parties and maybe even using it to create a new opportunity for future products or services? Curious about other Customer tools? Check out the Customer Assessment, just released.